Firefox connection is not secure is one of the well-known issues faced by the users. In this post, you will find why you’re seeing this error. Firefox is one of the best and secure web browsers available for Windows. The majority of the users prefer to use it as the default browser in comparison of Chrome and Edge browser, especially developers. While using any browser, users can expect unusual errors and so do in the case of Firefox. Sometimes problems are so sticky that troubleshooting is tough and impossible in special cases. 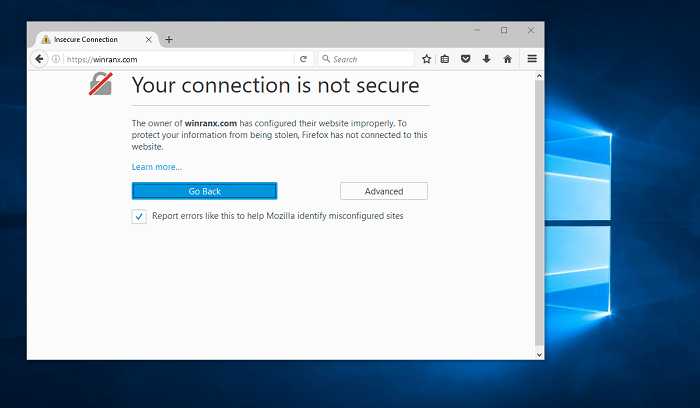 One of the common problems about which lots of Firefox users reported over the web reads “Your connection is not secure“. The error also tells users why they facing the issue in warning note, but not all the users understand it. So I’m sure that lots of users want to know about why they seeing Firefox connection is not a secure error. By keeping this thing in mind I decided to cover this detailed post explaining the cause by behind this Firefox issue. When a user on Firefox try to connect a secure site (the URL starts with https://), at first browser validate if the certificate presented by the site is proper and the encryption level is hard enough to ensure the overall protection of the privacy. 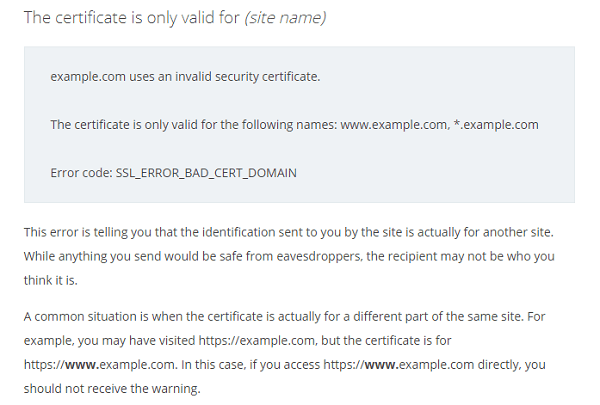 In case, site certificate is not validated or encryption is not solid. 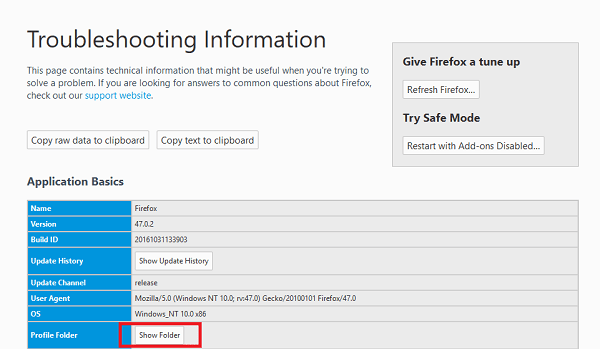 In this situation, the Firefox stop connection to the site and show an error about which this whole article is based. The worst part about this error is that in most of the cases it is impossible to troubleshoot the issue because its website owner side error and you can do nothing about it. Even if you’re seeing this error, the best thing you can do is to click on the Go Back button, if you’re really concerned about your privacy. Although, you can avoid this warning message and head over to the website anytime. But before overriding the warning message, you must understand the consequences of using a website with a vulnerable communication channel. Recommended: Do not make any purchases on site with these error message until the warning completely goes off. In case, you want to know why you’re seeing Firefox Connection is Not Secure error, then you need to click on Advanced button and it will show you exact warning message with an error code. There are different error code which usually comes up. Why don’t you check out all the error codes and find out why the connection is not secure. Click on the Start button -> Settings icon -> Time & Language. Here set the right date, time, and time zone. Once done, close the settings window and restart the browser. And check if the error is still coming. Note: In case, after changing the date and time, it automatically reset after a reboot, then it indicates that real time battery cell is running low or empty. And it is the time to replace CMOS. 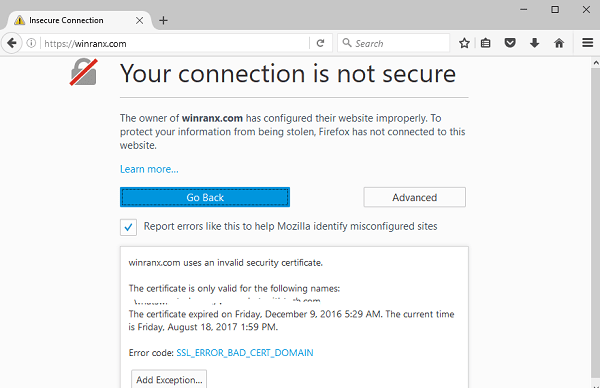 In case, you’re seeing the error in NON-HTTPS websites, then it indicates that some security program on your system or network is preventing your connection and sending the certificate in a manner which forcing Firefox to mistrust it. In most of the cases, the antivirus program that comes with a feature named as scan encrypted connections, then in this condition try to reinstall antivirus program. 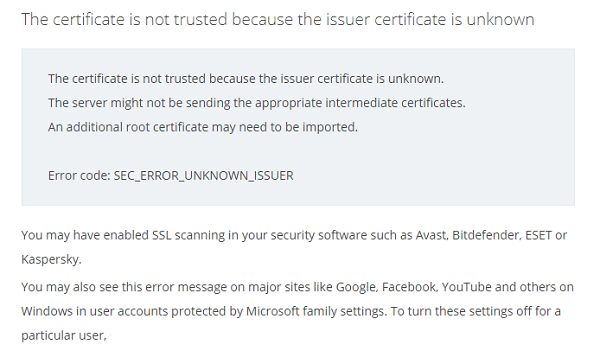 This in result triggers the antivirus program to inject its valid certificate again in the Firefox trust store. You can check out this Firefox support page for more details on different antivirus programs. Sometimes due to the presence of malware and viruses into your system is the reason behind Firefox connection is not secure error. So install some good antivirus or malware cleaner to remove its malicious files and folders from your computer. 1. In Firefox, click on the Menu button available at the top right corner of the screen. 2. After that click on Help icon -> Select Troubleshooting information. This will launch the troubleshooting tab. 3. Under Applications basic section, you need to click on Open folder button. This will take you to profile folder. Here you will find out lots of files. 4. 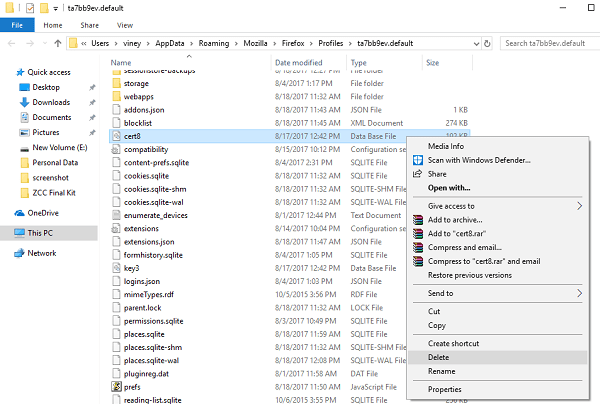 Look for the file named as cert8.db and delete it. After following all the suggestions discussed above, you’re still seeing the error code, then you must try to contact the owner of the website and tell him about the error code. Maybe the owner of the website needs to renew the expired certificate. In case, the site has weak encryption level, then you will see the option to open the page using the outdated certificate. You can also report the error to Mozilla. For that, on the error page, you will see a note which reads “Report errors like this to help Mozilla identify and block malicious sites” with a check box on left side. You need to tick mark this box. And you’re done. I hope you found sufficient information about Firefox Connection is Not Secure Error. If you still have any doubts or query drop it in the comment section. You have explained amazingly about firefox connection.This is actually a nice topic.I will follow which you provide us. Thanks for sharing such a wonderful article. It’s an honor that you find my blog post useful. Please keep visiting for more useful information. Its been a whole day to search for a resolution. some of them I research in google entails with servers and stand-alone computers. And I found a solution for this issue and it works like a charm.